This week on The Bugcast: after an unplanned week off, we’re back with sad news from the world of comedy, and 8 tracks of Creative Commons and independent music from The Madpix Project, Angela Soffe, Quentin Hannappe, Reform The Resistance, Barefoot McCoy, Slain, Banana Cream, and Fingers Crossed. 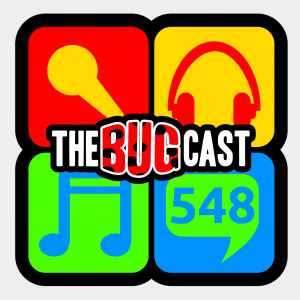 This week on The Bugcast: we reflect on the mess that is the UK currently, the perils of an online footprint, and play 8 tracks of Creative Commons music from Lost in the World, Omonoko, The Black Sunn, Scott Altham, Clash Clash Bang Bang, David Krystal, House Of The Old Boat, and Pure Mids. This week on The Bugcast: a YouTuber intends to “go gay” for a month, the decline of the “podcast”, and 8 tracks of Creative Commons music from The Devil Music Co., The Big Knitters, Quietly Concerned, Kinematic, Julie & Gent, An Amerikan Automobile Company, Admiral Bob, and Philip Taylor Jr. This week on The Bugcast: we welcome in the new year with a round up of our New Years Objectives for 2018, set our new ones for 2019, and play 8 tracks of Creative Commons and independent music from Shearer, Townhouse Woods, Rasmus Söderberg, Martinez, Botany Bay, RVNS, Dave-G, and Aphemia. This week on The Bugcast: a short snappy show, released in the final hours of 2018 as we say farewell to the year with gratitude, with 4 Creative Commons tracks from Rising Bones, The Jaygles, The Devil Music Co., and eve. This week on The Bugcast: we present our Christmas special, with a rant about the Gatwick drones situation, our Christmas celebrations thusfar, and 8 Christmas Creative Commons tunes from Happy Funerals, Neon NiteClub, Emily Richards, Moira Waugh, Kate Orange, Claudia Fenslau & Siobhan Dakay, Songwriterz, and Lawrence Beamen. This week on The Bugcast: ChrisFromCanada takes over the controls, and plays you a whopping TEN phenomenal tracks of independent and Creative Commons music from IOMAIR, Detonics, Black Cat Biscuit, Fresh Body Shop, Radio Star, Alyssa Riley, The WInd Whistles, Flagship Romance, Color Out, and TWNRVA. This week on The Bugcast: an update on the pool marathon and our November projects, a rant about misuse of the emergency services, and 8 phenomenal tracks of Creative Commons music from Mallz & Deron Alek, Zinegoline, Yavor, Toukay, The Glass Child, The Woods, The Devil Music Co., and SadMe.